The second 2018-19 Game Dated Moments Rookie of the Month Achievement for November is now live on the site! Collectors who have collected all released 2018-19 Game Dated Moments cards from the month of November can now head to the ACHIEVEMENTS page to redeem for this achievement. Be sure to hold on to these Rookie of the Month Achievements through the end of the hockey season so that you can redeem for the 2018-19 Game Dated Moments Autograph Parallel Achievement once all cards for 2018-19 have been released. 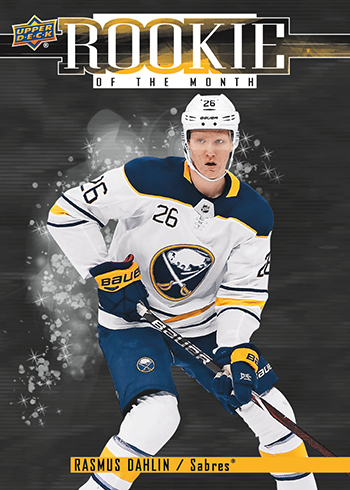 Collectors who redeem a complete 2018-19 Game Dated Moments – November set on Upper Deck e-Pack™ and elect to redeem them for this Rookie of the Month Achievement – November card will have that achievement card added to their e-Pack collection, with the ability to have the physical card mailed to them. The highly anticipated 1st pick of the 2018 NHL Draft, Rasmus Dahlin, did not disappoint during the month of November. Dahlin found a way to tally 1 goal and 9 assists while maintaining a +9 rating for the month. During November, the rookie defenseman helped the Sabres to a 11-3-1 record while establishing a franchise record 10 game win streak on the way. The future looks bright for Dahlin as he continues to live up to his 1st pick hype. It’s not too late to grab retired Game Dated Moments that you may have missed to complete your 2018-19 Game Dated Moments – November set and redeem for this achievement! 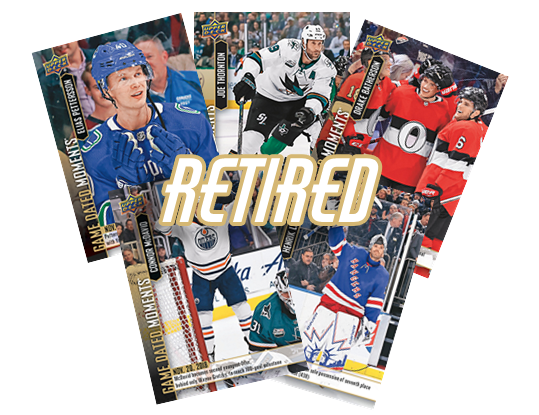 Head on over to the e-Pack Trading Marketplace and spark up a trade for these retired 2018-19 Game Dated Moments – November cards to complete your collection! *Game Dated Moments Rookie of the Month Achievement – November cards may be shipped or transferred to a linked COMC account. However, this option will not be enabled until 3-4 weeks after the achievement has been pushed live on the site. If you have this Game Dated Moments achievement card in your collection on e-Pack when the option to be shipped has been enabled, you will receive an e-mail from e-Pack alerting you. Product depicted for demonstration purposes only and is subject to change without further notice. © NHL. © NHLPA.